Warm-up exercises should be on the agenda for the beginning of every class. 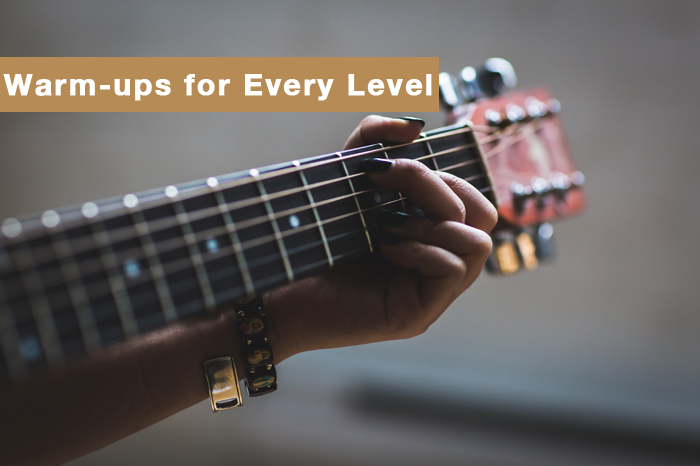 Most likely, many of you have created some warm up exercises that consist of single notes and/or chords. An excellent sequence of finger exercise to wake up the fingers and get things going is written below. You many have had your students do the warm-up exercise that consists of playing the first string open. Then, the first finger on the first fret, on the first string followed by the second finger on the second fret on the first string, third finger third fret, fourth finger on the fourth fret. This sequence is then repeated on strings 2, 3, 4, 5, and 6. The following chart shows the finger orders that can be used. The patterns should be played on each string. Each pattern can be played starting on the first string, or the sixth string, and then the pattern can be repeated on each string. The patterns can be played in first position and then played in fifth position. Of course, the entire sequence would not be played in one session. Have the students play the first sequence and then after they feel comfortable with it, move on to the next sequence. There are 24 permutations of the four left-hand fingers numbers. So, these warm-ups will keep them busy for a long time. The sequences are listed in the order they should be presented. The number on the left of each sequence is for reference. Feel free to make copies and give to your students. These “finger twisters” will go a long way to develop finger coordination. Hello Mike, awesome exercises! I’ll use them to enhance their scale stidies. Met you 2 years ago at the NJMEA convention. You ever coming back? Thanks. Thanks John. I’d love to. I remember doing those sessions and being very impressed with the teachers. Although, as I remember, it was bitter cold, the educators were very warm and welcoming. I hope to get there again. Maybe some of the teachers there will consider hosting a workshop. I have been doing those around the country. The workshops give me more time to get into pedagogical material in more detail.